Email is still the killer app of the Internet. I wrote about unleashing your message a couple of months ago but forgot to include one important method – including social links. It’s easy to take email to the next level by adding social media friendly links to your messages. 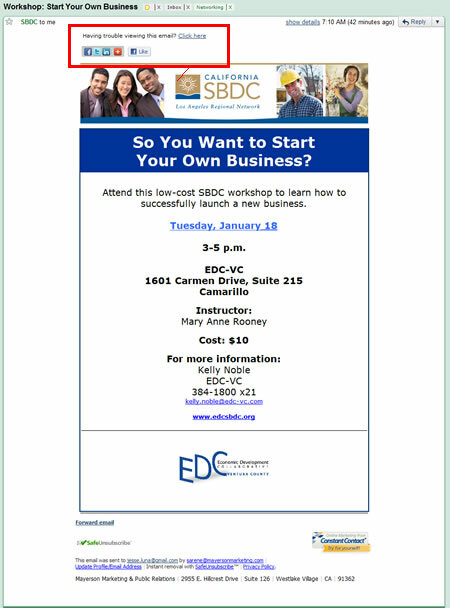 In the example below, the EDC-VC (Disclaimer, I’m a business advisor there) is sharing information about an upcoming workshop for startups in the Ventura County, CA area. The EDC-VC uses Contact Contact for its email services. * Share it on Facebook. When someone shares an item on Facebook it will be added to their Profile page. Or, they can take the web URL and share it on any of their Facebook Pages. * Tweet out a link on Twitter. You don’t even have to be active on Twitter to allow people to share links to the offline version of your email newsletter! I just tweeted out a link to the email below. Wouldn’t you want someone with over 8400 followers to be sharing your content? * Post to LinkedIn. More and more business users are posting information to LinkedIn. For some, LinkedIn is the only social networking site that they are allowed to post to during the work day so they like to share great and relevant content. The other powerful link on this email message is the “Having trouble viewing this email. Click Here” section. By clicking the link, viewers are able to go to the online version of the site then use all their usual methods of sharing information. This is subtle feature but extremely powerful. By adding social links to your email newsletter, you extend the reach of your message and are reusing that content for different platforms. How awesome is that? So if you’re building an email list for your business, I strongly suggest you look into any feature that allows you to share your content via social networks. It will help your messages run wild! This entry was posted in Events, How-To, Local Businesses, Marketing, Small Business, Social Media, Training, Uncategorized, Ventura County and tagged Constant Contact, content reuse, EDC-VC, Email, Email Marketing, Small Business, social linking, Start Your Own Business. Bookmark the permalink.